12 January 2018 - 12-year old Aayan Ismail today won GP4 - the fourth tournament in the 2018/19 Newham Junior Grand Prix. Aayan scored 5/5, beating Mateusz Bazan, who finished second, in the final round. In third place was Nii Tettey Amasa-Attram, also with four points. This was Aayan's third successive victory and he now seems certain to retain the overall Grand Prix title he won last year. GP5, the final tournament, in the series, is on 16 February. Go to https://form.jotformeu.com/90113986914361 for more details and to enter. A partnership between Chess in Schools & Communities and the London Borough of Newham. This took place on Saturday 20th October 2018: The Old Town Hall, 29 Broadway, Stratford, London, E15 4BQ. An ECF rapidplay-graded six-round Swiss tournament for players of all ages and abilities. There were three Sections: Open, ECF graded U-140, ECF graded U-80. More news to follow as soon as possible. 27 October 2018 - Aayan Ismail [pictured], the winner of last year's Grand Prix, extended his lead this year, scoring 5/5 in today's second round, held at Beckton Library. Aayan had a scare in round two against Kelvin Sermaxhaj, a pawn down going into a rook-and-pawn endgame - but his technique told. Kelvin, last year's bronze medallist, beat Joshua John - the 16/17 champion - in the following round, but lost in the last round loss to newcomer Abhimanyu Tiwari, who finished second. The third round of the Grand Prix is on Saturday 24 November. Go here for more details and to register. 29 September 2018 - Shahjahon Saidmurodov played white against Aayan Ismail today in the final round of the first tournament in the 2018/19 Newham Junior Grand Prix. Shahjahon won the first Grand Prix, in 2016; Aayan was the 2018 winner. Shahjahon won in under thirty moves with a fierce attack against Aayan's castled king. Shahjahon thereby scored 5/5, putting him 26 points clear in the Grand Prix. "It was great to see two former champions going head-to-head in the final round", said Alan Bright - the tournament director and a tutor with Chess in Schools and Communities. "It was also a great experience for their other opponents - having the opportunity to play such strong players". In third place, with 4/5, was seven-year old Karam Balaggan, playing in only his second Grand Prix event. He played neither Shahjahon nor Aayan, but his victims did include Aryan Gohil - last year's under-nine champion. The second round of the Grand Prix takes place on Saturday 27 October. Click here more information and to enter. 26 April 2018 - St Joachim's today won an invitational tournament at St Anne's in Custom House. The format was an all-play-all between eight eight-player teams. St Joachim's won five matches, drawing with Gallions, who finished second, and St Helen's. This follows the school's success at Ellen Wilkinson last month. Alex Bruckshaw, Gallions' board two, was the only player to score 7/7. 26 March 2018 – Big well done to St Joachim's Primary, who won this year's Ellen Wilkinson primary school invitational tournament. Nii Tettey Amasa-Attram from St Joachim was the individual winner with 5/5. His team-mates Otigbo, Laurelle Asare and Anwulikaego Obi were each the highest scorers for their age. The top scorer for the hosts, Ellen Wilkinson, was Kayaan Shah with 4/5. Gallion's star performer was Mark Hodovanets, who scored 3½/5. Top scorers for the other two schools, Gallions and Grangewood's, were Cherry Wu and Raghav Dash respectively – both 3/5. The tournament comprised 27 players competing over five rounds. 17 March 2017 - Joshua John from East Ham scored 2 ½/3 on board one for Newham in Bromley today in his final appearance in the English Primary Schools' Chess Associations' team under 11 team eastern zonal. Newham scored scored 17 points overall - its second highest score in the five years that the borough has entered. Joshua was in the very first team, in 2014 as a seven-year old, and is the only player to have represented Newham all five years. "Joshua has been a great servant to the team", said Alan Bright, the Newham manger, "and his two wins and a draw against three of the best under-11s in the south of England is a terrific way to bow out." 10 February 2018 - Aayan Ismail from Tower Hamlets today won the final round of the Newham Junior Grand Prix and with it the overall 2017/18 Grand Prix. He scored 6/6 for an overall Grand Prix score of 779 points. Second in the Grand Prix was Greenwich's Mateusz Bazan with 704 points; Kelvin Sermaxhaj, who came second today, was third overall. Under-nine champion was Aryan Gohil from Manor Park. Bhavika Raghupatruni was the girls' champion. The photo shows all the prize-winners from today and the overall Grand Prix. This year's Grand Prix had a record 66 entrants. The first round of the 2018/19 Grand Prix is planned for September. 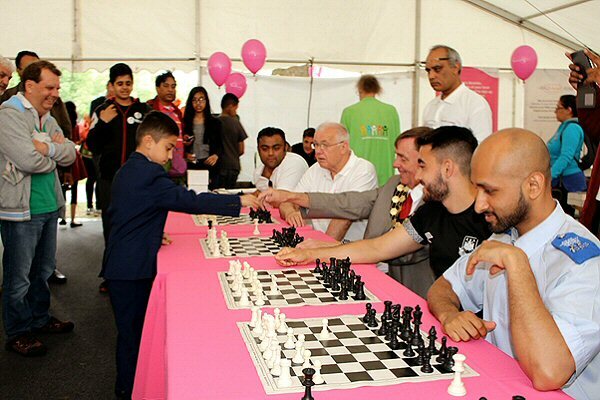 On Sunday 10th July 2016, Chess in Schools and Communities Newham supported the Newham Lord Mayor’s Show with a chess tent, where all comers could play throughout the day. One of the stars of the Newham junior squad, Shahjahon Saidmurodov, made a big impression on everyone by giving a simultaneous display against members of the police force, fire and ambulance services, as well as council leader Ken Clark and Lord Mayor Sir Robin Wales who, we discovered at the inaugural event in Newham and then again in an online match with the Mayor of Sunrise in California, is an accomplished player himself. 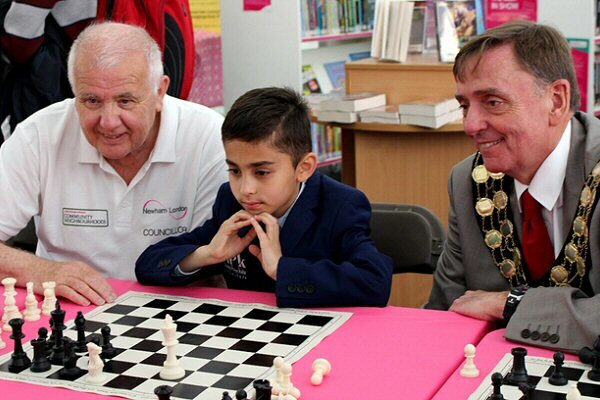 In an impressive display, 10-year old Shahjahon defeated all his opponents, with the Mayor putting up the longest resistance in a close game.